Hello! Today I'm excited to show you a couple of projects that I made with the one of the newest Doodlebug collections, Take Note! For the next couple of days, the Taylored Expressions Baker's Dozen will be showing you some projects made with the newest (Winter CHA) Doodlebug collections. I was so excited when Regina (our fabulous TE Marketing & Social Media Coordinator) announced a partnership between TE and Doodlebug and asked if we wanted to participate. Of course, I said yes! I love all things Doodlebug! I received the Essentials Take Note collection, and I just love the bright, bold and fun colors in it! When I first saw the colors and patterns, it made me think of the fun, ruffly shirt that Sabrina wore on the first day of school last August, so I created this layout with a few photos of her. 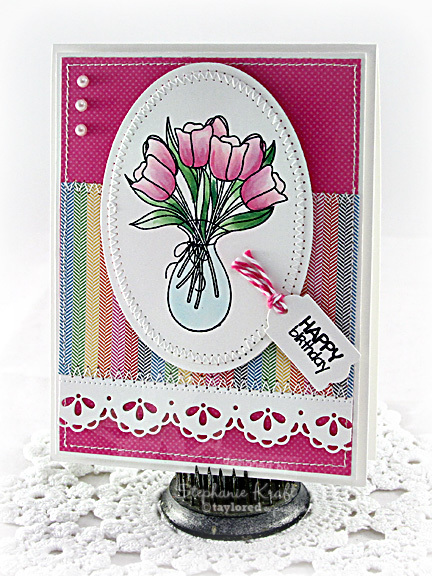 I used a combination of the Doodlebug products along with TE stamps and dies. They are a match made in heaven! The green arrow paper (cut in half and positioned so that the arrows point to the center of the layout) and the grey number paper are included in the Essentials Kit. 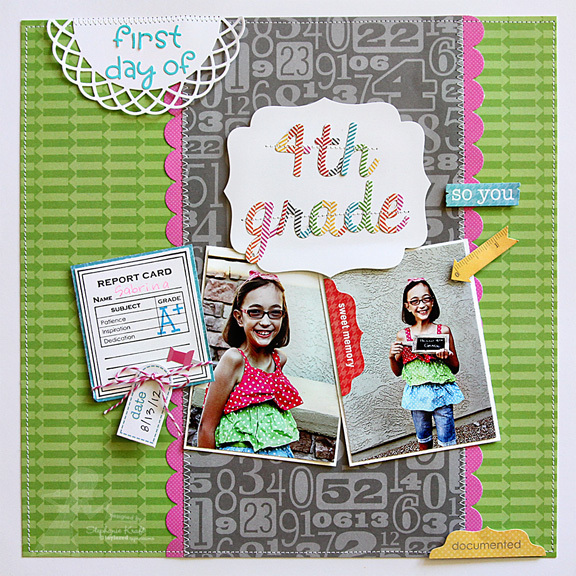 The tiny pink polka dot paper is from the Take Note 6x6 paper pad (die cut using the Medium Scallop Border). 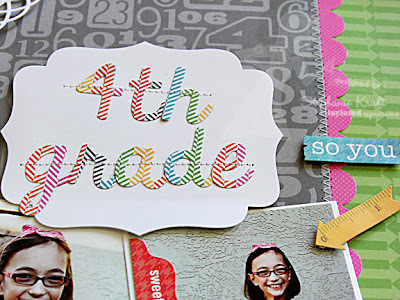 The first part of my title "First Day of" was created using some of the letter stickers in the kit (here I halved a Layering Doily Die - large). I stamped the "report card" and the A+ from Make the Grade. I tied some Bubblegum Doodle Twine around the bottom and added a few more Doodlebug stickers (the pink push pin and the date tag). 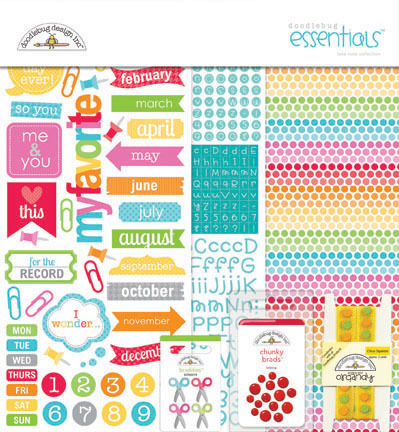 Below is a look at the Take Note Essentials Kit. As you can tell, there are a lot of elements (much more than I used). I plan to make a mini album with the 6x6 papers and use a lot more of these stickers, too. I have a card using the Take Note 6x6 paper pad. Note that these are the same patterns as the 12 x 12 papers, but just smaller in design, so they are perfect for cards and other small items. My image is from Spring Tulips and colored with Copic markers. My mom's birthday is coming up in a couple of weeks, so I made this for her. For links to all of the designers with Doodlebug projects, please visit Taylor's blog, HERE! Accessories: Taylored Dies: Labels Stacklets 2, Layering Doily Die - Large, Medium Scallop Border, Whimsy Alpha, Whimsy #'s (Taylored Expressions); Bubblegum Doodle Twine (Doodlebug), Foam tape, Thread, Sewing machine. Accessories: Taylored Dies: Lace Chain Border, Designer Mini Tags (Taylored Expressions); Petite Oval Nestabilities - SM, LG (Spellbinders); Markers (Copic), Bubblegum Doodle Twine, Pearls (Doodlebug); Foam tape, Thread, Sewing machine. These are gorgeous Stephanie! I love this paper and I'm going to have to go get this set. :) LOVE your layout and the wonderful sweet card! Darling projects Stephanie! Love the sweet photos of Sabrina! Such fun and Spring colors! The vase of tulips is gorgeous! Sweet card, love all the papers, so cheery! She is SO darling Steph, and your page is FABULOUS!!! LOVE it!!! GOrgeous card too!!! Sweet layout of your daughter! Beautiful card, too! Your daughter is so cute, lover her outfit! Your layout is so cool (says the girl who can't do layouts!) and your card is gorgeous too! Hugs!